The Nauvoo Pageant ran from 1976 to 2004. It drew the largest crowds of any outdoor theatre event in the world. This new recording was put together in 1999 and used during the last five years of the pageant in Nauvoo, Illinois. 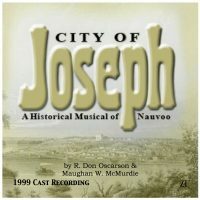 The original Nauvoo Pageant, City of Joseph portrays life during the establishment and growth of Nauvoo, Illinois, under the direction of the Prophet Joseph Smith. This recording features all the music from the original pageant as it tells the story through the eyes of those who lived there from 1839-1846.